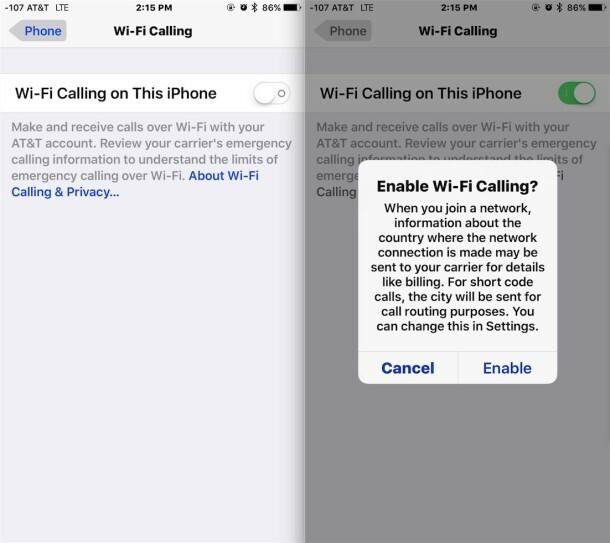 Most major cellular carrier networks support a feature known as Wi-Fi Calling, and now you can enable wi-fi calling on the iPhone as well. For the unfamiliar, Wi-Fi calling essentially uses an available wireless network for phone calls to improve the connection quality, rather than relying entirely on the cellular network. The result is generally cleaner and crisper sounding call quality, similar to the difference audibly observed through other Voice Over IP services like Skype and FaceTime Audio. Another significant perk to wi-fi calling is that you’ll be able to make and receive phone calls even if your iPhone is in an area where you otherwise wouldn’t have cellular service, assuming the area or region does have wi-fi. This is a really common scenario in many cities and buildings, and this is really where wi-fi calling is at its best. Wi-Fi calling is available now on most new iPhone models with most cellular carriers, though some devices may need to be running the latest version of iOS to have access to the feature. Once enabled the Wi-Fi calling button will be green. You’ll want to be sure to review the emergency information, because if you were to dial emergency services from a location with wi-fi calling, it’s the information that is relayed to the responder. This is important and not something to overlook or ignore, and also shows the potential downside to the wi-fi calling feature, since the set address doesn’t change with your location, whereas a typical cellular signal can be triangulated for a general idea. If you decide this is not appropriate for your situation, you can always turn wi-fi calling back off again. 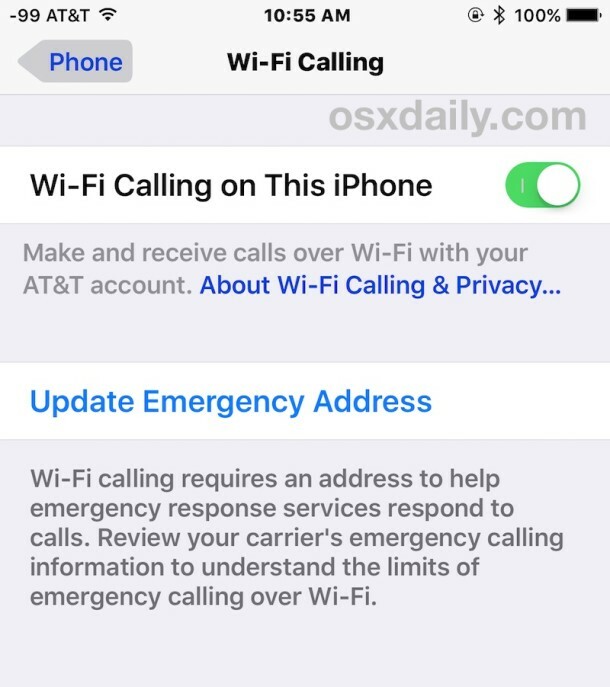 Once Wi-Fi Calling is active and you join a wi-fi network with the iPhone, you should see the cellular carrier data change in the upper left corner of iPhone to demonstrate the feature has been enabled and is active. This looks like AT&T Wi-Fi, Sprint Wi-Fi, Verizon Wi-Fi, T-Mobile Wi-Fi, and so on (for those who may be wondering, the numbers next to the carrier name are the cellular signal strength as shown from Field Test Mode, which can replace the usual signal dot indicators if you’d like). As mentioned before, wi-fi calling is really most helpful if your cellular connection service is poor, but you have a wi-fi network to connect to. This can help to eliminate the no-signal zones that are often found in office buildings and parts of a town where some obstruction blocks a clear cellular signal. Using Wi-Fi Calling. Wi-Fi Calling allows you to communicate through calls and text messages over an existing Wi-Fi network. To use Wi-Fi Calling, your device must be set up for AT&T HD voice, and you must have access to the Internet through your device’s Wi-Fi connection. Your device will only route calls and texts over Wi-Fi Calling when cellular coverage is limited or unavailable (for example, in some indoor locations where it is difficult for a strong wireless signal to reach or when your device is in airplane mode with Wi-Fi enabled). If you lose your Internet connection during a voice call with Wi-Fi Calling, your call will disconnect unless you are also within AT&T HD Voice coverage. You can disable Wi-Fi Calling by toggling it off in your device settings menu. You can use Wi-Fi Calling for voice calls within the U.S., Puerto Rico, or U.S. Virgin Islands at no additional charge. However, if you have a capped or pay-per-use text messaging plan, your text messages sent through Wi-Fi Calling will be billed at standard messaging rates in accordance with your messaging plan. If you make international long distance voice calls using Wi-Fi Calling, you will be charged international rates consistent with your applicable rate plan or optional international long distance calling package that you have purchased. For a list of AT&T international long distance calling rates and packages, please visit att.com/worldconnect. You cannot use Wi-Fi Calling outside of the U.S., Puerto Rico, or U.S. Virgin Islands. Due to technical limitations, Wi-Fi Calling cannot be used to initiate calls to 211, 311, 511, and 811. TTY Limitations for 911 Calls. Due to technical limitations, Wi-Fi Calling cannot be used with TTY devices and will not support 911 calls over TTY devices. Persons with communications disabilities can still reach 911 services by either (1) calling 911 directly using a TTY over the cellular network or a landline telephone, or (2) sending a text message to 911 directly (in areas where text-to-911 is available) using a wireless device over the cellular network, or (3) using relay services to place a TTY or captioned telephone service (CTS) call over the cellular network or a landline telephone, or (4) using relay services to place a IP Relay or IP CTS call over a cellular data or other IP network. Emergency service from this device using Wi-Fi Calling may be limited in comparison to traditional 911 service. Other cellular providers will have a similar notification, be sure to read and understand the limitations and details before using the wi-fi calling service on any network. Wi-Fi calling on iPhone is far superior to traditional cellular mobile call quality. It sounds great if both sides are on wi-fi and using the feature. Aside from that, being able to get service in ‘dead zones’ like some office buildings and houses is fantastic. Great feature, glad it is supported by nearly everyone these days. This is only supported on iPhones 5c and newer. It is also supported on some windows phones where T-Mobile is the carrier. It doesn’t work on 5s with iOS9.3.1 on Verizon. I was hoping that the latest iOS update would have fixed that but apparently not. Apparently the 5S on AT&T is NOT eligible either. I have a friend with an AT&T iPhone 5S that uses Wi-Fi calling at his house, maybe it is plan dependent? Call AT&T and ask them. Be sure you are updated to the latest iOS version on the iPhone (Settings –> Software Update). I use it on iPhone SE, iPhone 6S, iPhone 6 and it works very well. I have the latest iOS. The AT&T website specifies the phones that it supports for Wi-Fi calling. The 5S is not included. A Wi-Fi Calling capable device. Devices include iPhone 6 and 6 Plus, iPhone 6s and 6s Plus, and iPhone SE with iOS 9.3 or later. I don’t know how your friend is using Wi-Fi calling, but according to AT&T, they can’t. Only works in countries mentioned. Does att charge extra to turn this on? No, AT&T does not charge extra for wi-fi calling on my iPhone plan. It could be different on other plans, but it will let you know when you enable it. I have never heard of anyone being charged for wi-fi calling, only for wi-fi tethering (when you connect Mac to your iPhone for internet). If anything the carriers usually like wi-fi calling because they don’t have to use their own network, they transmit over wi-fi and use your cable company instead. That’s actually why I’d never use it, unless the carrier charged less. Otherwise you’re just giving them a free ride on your Wi-Fi connection (or that of some other provider). You could (perhaps, should) just as well use a SIP account with access to the PSTN, or Skype, or whatever. Sebby: The wifi calling will only connect when your cell signal is not strong enough so for people who live in homes with a metal roof, in an apt with firewalls or miles from a cell tower, this is wonderful technology and not a way for the cellphone companies to “get out” of providing network coverage. The carrier is not going to charge “less” for using wifi calling. Why would they? How are they supposed to know where you will be taking your phone? Your reply is ignorant. @GrannyJannie: Wi-Fi calling is used when possible. You subsidise your carrier when you use it, because you are not using their infrastructure, which the use of Wi-Fi effectively disincentivises them from building. It doesn’t matter how great the experience is: you are overpaying. And of course the carrier could charge less, according to the connectivity–they own the network. Naturally, anybody wishing to take advantage of Wi-Fi for calling into the PSTN or elsewhere for entirely legitimate reasons can do so more cost-effectively, but not using Wi-Fi calling. You needn’t worry that people are starved of the miracle of VOiP–unless, of course, your own ignorance, and not just that of your comment, is the product of a well-oiled telecoms lobby, and not the grassroots concerns of legitimate consumer interests you claim to stand for. Wi-Fi calling isn’t supported by Straight Talk’s Bring Your Own Phone (BYOP) program, only on phones purchased from them. I’ve not been able to get them to explain why. Bummer. I had no idea wi-fi calling existed, this is a great feature that I am appreciative of. Thanks for pointing this out, I never would know to look in the menus to find things like this. Is not working in Germany, Ireland and United Kingdom No carrier support this function. > Once Wi-Fi Calling is active and you join a wi-fi network with the iPhone, you should see the cellular carrier data change in the upper left corner of iPhone to demonstrate the feature has been enabled and is active. I don’t think this is true if you’re getting four or five bars, at least not with AT&T – if I’m on wifi and my signal strength is two bars or worse, I get the “AT&T Wifi” indicator and it works like a charm, but if I’m on a wifi network and have four or five bars, the “AT&T Wifi” indicator never appears and my calls get routed over the cellular network anyway. I wish there was a toggle to *force* the phone to route calls over Wifi, even when the cellular connection is supposedly good, because I’ve had multiple people comment that my calls sound worse over the cellular network, even when I have five bars. Are you sure about the display when in use? I have an iPhone 6S with wifi calling enabled. When I make a call, I see the signal strength indicator dots, Verizon, and the wifi symbol. It doesn’t say Verizon Wi-Fi. (My iPhone 5 would read signal strength dots and Verizon when I made a call (i.e., no wifi symbol)).